PHILADELPHIA -- A federal appeals court on Thursday threw out some of the convictions for which a Pennsylvania ex-congressman is serving a decade-long prison term but upheld and reinstated other counts. The 3rd U.S. 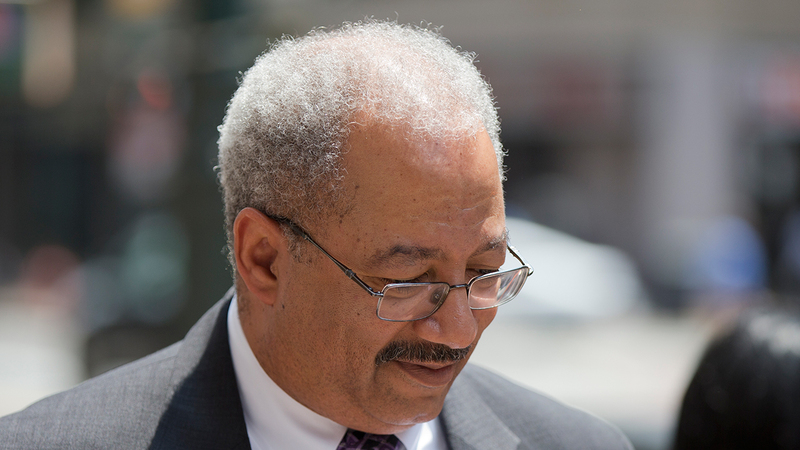 Circuit Court of Appeals overturned four criminal convictions against former U.S. Rep. Chaka Fattah, a Philadelphia Democrat, citing in part a recent U.S. Supreme Court decision that narrowed the definition of political graft. The judges said federal prosecutors could retry Fattah and co-defendant Herbert Vederman for conspiracy, bribery and money laundering. The appeals court also reinstated the convictions of both men for bank fraud and making false statements to banks. The U.S. attorney's office in Philadelphia said it was reviewing the decision. Fattah's lawyer declined comment and Vederman's did not return messages. Fattah's legal trouble relates to his unsuccessful run for the Democratic nomination for Philadelphia mayor in 2007. He routed a $1 million loan through a consultant, then reversed the secretive moves through a charity and others when the debt was called. Fattah is a former state lawmaker who spent two decades in Congress before his 2016 conviction on charges that also included racketeering, fraud and obstruction. The newly dismissed charges involve allegations Fattah accepted "things of value" from businessman Vederman, described as his personal friend, in return for arranging a meeting between him and the U.S. trade representative; unsuccessfully trying to get Vederman an ambassadorship; and hiring Vederman's longtime girlfriend, Alexandra Zionts, for two months on his congressional staff in Philadelphia. The three-judge appeals panel, citing a U.S. Supreme Court decision in overturning the public corruption convictions of former Virginia Gov. Bob McDonnell, said the trade representative meeting was not illegal and that Fattah's work to get Vederman an ambassadorial appointment needed to be reviewed by a jury that was properly instructed about the relevant law. The court said jurors could decide if Fattah's acts regarding the potential ambassadorship - three emails, two letters and a phone call - constituted the type of "decision" or "action" needed to support the charge. As part of his efforts, Fattah hand-delivered a letter about Vederman to then-President Barack Obama in 2010. "Determining, for example, just how forceful a strongly worded letter of recommendation must be before it becomes impermissible 'pressure or advice' is a fact-intensive inquiry that falls within the domain of a properly instructed jury," the judges wrote. The judges said hiring Zionts was "clearly an official act. But because we cannot isolate the jury's consideration of the hiring from the first two categories of charged act, we must reverse and remand." Two other dismissed counts, money laundering and conspiracy, revolved around allegations Vederman provided $18,000 to help Fattah purchase a vacation home in the Pocono Mountains. The reinstated bank fraud and false statements charges against both men involve how the $18,000 was described in obtaining a mortgage. Vederman agreed to purchase Fattah's wife's 1989 Porche, when in fact she retained the vehicle and it was found by federal agents when they raided the Fattahs' home and garage in 2014, the judges said. Fattah is currently in a federal prison in northwestern Pennsylvania, with a release date of 2025. In addition to the bribery case, he was convicted of using more than $600,000 in government grants and nonprofit funds on personal and campaign expenses.